LG TV won't recognize MKV video files - Solved! It is common to play videos on Smart TV via USB port. But when some people play MKV files on LG TV, they got failed. Why Does LG TV support MKV video format from USB playback Read on this article and you can get the answer and the solution to solve the problem when you can't play MKV videos on LG TV via USB. First of all, if your LG TV is a new one, then it surely comes with one of those instruction type books that tells you what type of files it will play. It will be very clear to know if your LG TV supports MKV format when playing videos via USB HDD. If you have no one user manual to check what formats your LG TV supports, the situation will be more complex cause different LG TV models have different supported video and audio formats. Although it makes very little difference, it often has difference on video and audio codec. After all, mkv is a container, as we all know, and it can contains various video and audio codec which will really depend the file whether can be played on LG TV via USB or not. Bit rate/resolution etc will have a large part to play in this, don't expect a TV to play back a high bitrate mkv. In addition, new LG 4K TV models and older LG Smart TV models usually have obvious difference on video and audio formats and codecs cause 4K video is encoded with more compressed codec to give people higher video resolution while smaller video size. Below are some examples we collected that if LG TV supports MKV. You can know if your LG TV supports MKV video or have a hint to know why your LG TV can't play MKV video via USB HDD. patible video and audio formats. The following table specifies all the supported codecs and containers by LG TV in details. .Mkv format is not supported in emulator. To play videos directly from a USB flash drive connected to a USB port on LG LED TV, the video should be in DivX HD format. Depending on the model, the LG TV supports DivX 3, 4, 5 and 6. MKV (MPEG-2, MPEG-4, H.264, VP8, VP9, HEVC) with Dolby Digital/DTS/MP3/AAC audio. 1. It's not supported AAC Main Profile. 2. Video files created by some encoders may not be played back. 3. Playback of video files stored on the USB storage device that do not support High Speed, may not work properly. 4. The TV supports DTS audio codec when the USB/HDMI video file playback. 5. The VP9 video codec may not be supported depending on the model. It is so complex to know if your LG TV supports MKV when you do not have an user manual, right Therefore, the easiest method to solve the issue that you can't play MKV videos on LG TV is to transcode MKV to LG TV more compatible video format with right codec using a video transcoder. 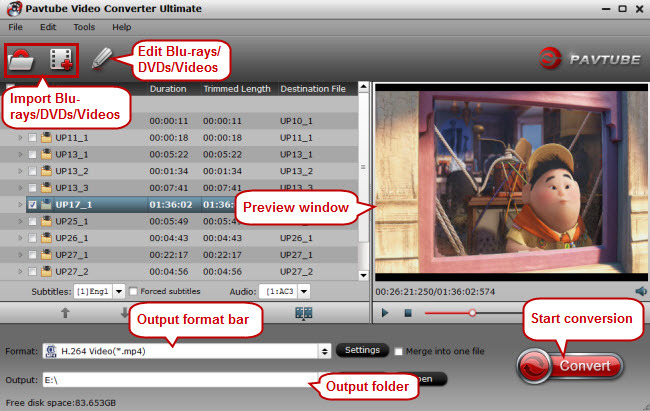 Pavtube Video Converter Ultimate gives you the tools to convert your video files to and from MKV format for use on multiple devices. This app makes the process of conversion accessible to users of all experience levels, and it works quickly, so you get the results you're looking for fast. It can convert all your MKV files with any video and codec like MPEG-1 MKV, MPEG-2 MKV, MPEG-4 MKV, H.264 MKV, H.265 MKV, VP8 MKV, VP9 MKV, DivX MKV, XviD MKV to LG TV supported MKV video or LG TV supported MP4, AVI, WMV video files. It also has LG TV optimized preset equipped with the most compatible video and audio codec. What's more, you also can convert your MKV video to 3D MP4 for LG 3D TV or you can convert any other video source video to 3D video for LG 3D TV. During the conversion process, you can choose one subtitle track then hard burn the subtitle to video then you can play video on LG TV with subtitle. You also can add external subtitle to the video for LG TV playback. If your MKV video has higher video resolution and bitrate, you can adjust the settings. Download and install the MKV to LG TV converter then launch it. You can load the MKV by clicking "File" or just directly drag and drop the MKV video to the software. If you want to convert MKV to LG TV in batch, just load multiple MKV video files. If you are using a Mac and want to change MKV to LG TV format, you can use the equivalent Pavtube iMedia Converter for Mac and the review can tell you more about the mac video converter. 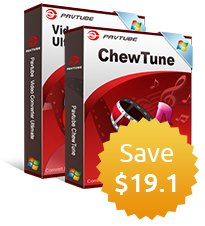 Pavtube product offers hundreds of video formats. You need to check your LG TV user manual to check what video format and codec that your LG TV model supports. Then you can choose the format from the profile window. You can choose H.264 MKV, H.264 MP4, DivX AVI and other LG TV supported video. 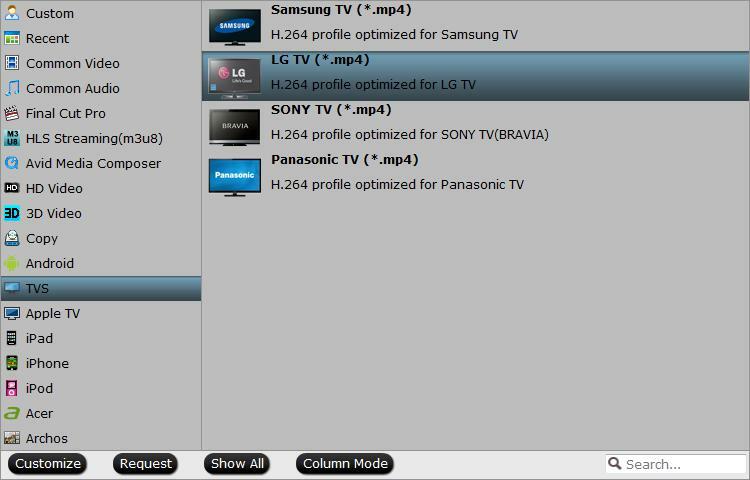 Pavtube also provides an optimized preset for LG TV. This preset is equipped with LG TV supported video and audio codec. But the resolution might not be suitable for LG 4K TV. If your LG TV is a 4K model, you'd better choose H.264 high profile MKV video from "Common Video" then adjust the video resolution to 3840x2160 for 4K LG TV. Before start the mkv conversion for LG TV, you can click the Settings icon and adjust the video size, video bitrate, codec, frame rate, audio sample rate, etc parameters, so that you can get a decent video on your Smart TV. After the settings, you can click "Convert" to start to convert MKV to LG TV in batch. The conversion speed depends on the video size. Normally, it will be quick to convert video files. After the conversion, you can locate the video files in the output folder. After the conversion, connect the USB drive with computer and head to the destination folder where the converted files are stored; transfer the files to the USB drive then playback your MKV files on the LG TV. If you have some other video files that can't play on LG TV, you also can use this video converter to convert the video to LG TV such as Video-TS to LG TV, MP4 to LG TV, MOV to LG TV and more. How to Choose the Right Smart TV? How to play DVD movies on LG TV using an USB Drive?